"Lisianthus" redirects here. For other uses, see Lisianthus (disambiguation). 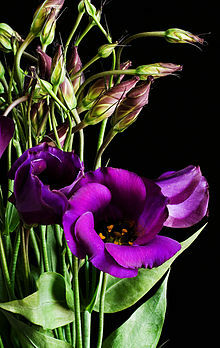 Eustoma, commonly known as lisianthus or prairie gentian, is a small genus in the gentian family. They are native to warm regions of the southern United States, Mexico, Caribbean and northern South America. This genus is typically found in grasslands and in areas of disturbed ground. They are herbaceous annuals, growing to 15–60 cm tall, with bluish green, slightly succulent leaves and large funnel-shaped flowers growing on long straight stems: sometimes erect single stems, other times growing on branching stems that can rise to be three feet tall. The flowers can grow up to two inches across and can be found in a variety of colors. They have been found in all shades of pink, purple, white, and blue. In addition, some are bicolored and some are occasionally found in yellow or carmine-red. Eustoma flowers are either single-flowered or double-flowered. Both types of flowers can be found in all ranges of the possible colors listed above. They are usually one to three feet tall, although there are dwarf varieties that only grow up to eight inches in height. Eustoma is a small genus, containing only two or three species. Eustoma is named after the Greek words eu, which means good, and stoma, which means mouth. Lisianthus on the other hand comes from the Greek words lissos, meaning smooth, and anthos, which means flower. Eustoma flowers are tricky to grow and require some maintenance. They have tiny seeds that must be sown on the surface, not buried, and they must be planted in rich, well-drained soil and exposed to full sun. They must be kept moist but not overwatered: overwatering may result in the growth and development of fungal diseases. Lisianthus flowers will begin to bloom in early summer and some will continue to bloom throughout the later months of the summer. When cut, Lisianthus flowers can last anywhere from two to three weeks in a vase. Eustoma russellianum is particularly popular and has a number of cultivars that are grown for the cut-flower market. ^ "Eustoma world origins". 2013-02-22. Retrieved 2013-03-18. ^ "Flora of the Southern and Mid-Atlantic States". This page was last edited on 3 July 2018, at 21:49 (UTC).